I am the one determining which state standard to focus on each week for English Language Arts (ELA), Math, Social Studies, and Science. I am the one writing the lesson plans, creating, collecting, organizing, and readying the materials for each lesson. I am the one finding ways to individualize the instruction and activities so all students can be successful, whether they are special needs or English Language Learners. I am the one in the front of the room gaining the attention of the class, teaching, redirecting, releasing them to practice in groups or with a partner. I am the one creating assessment to determine the level of learning taking place and what next steps I need to take. I am the one with the degree in Education. And yet I am the one being taught. Daily. From each student in my class. One student, slow to process information, teaches me patience. Another shows me he does not understand what I perceive to be simple social skills and reminds me that I need to teach this regardless of whether there is a state standard for it or not (and reteach and reteach and reteach it again). One boy, the youngest of four boys being raised by an overwhelmed father with no mother at home, is angry and flinches at the slightest touch. He is disruptive, disrespectful, mean, and is the reason that on most mornings I can hardly eat breakfast – my stomach hurting thinking about making it through the day. He has removed any resemblance of kind community in my classroom and others have started mimicking his behaviors. I am struggling to recreate our classroom family. Some days I am just happy to make it to the end of the day without crying. But strangely enough, he is the one I think I love the best. He is the one who brought tears to my eyes as we sat on the floor last week, him and I with one other student, finishing their poems about snowflakes. The other students had finished and were doing centers. We sat, heads bent over clipboard, pencil in hand. If I was a Snowflake I would be soft as… cold as… small as… beautiful as… and a special as me. We had brainstormed words to fill in the blanks and they also create some on their own. When he wrote in soft as a teddy bear, an original idea not found on our anchor chart, I placed my hand on his back and told him how beautiful his writing was. He did not pull away. We sat there not acknowledging my hand on his back. He wrote. I helped the other student sitting on the other side of me without moving my hand. He finished his poem and sat there a just moment longer. Then he got up to turn it into the turn in box. I took a deep breath. Not more than three minutes later he was sticking his tongue out at another student and calling them names. 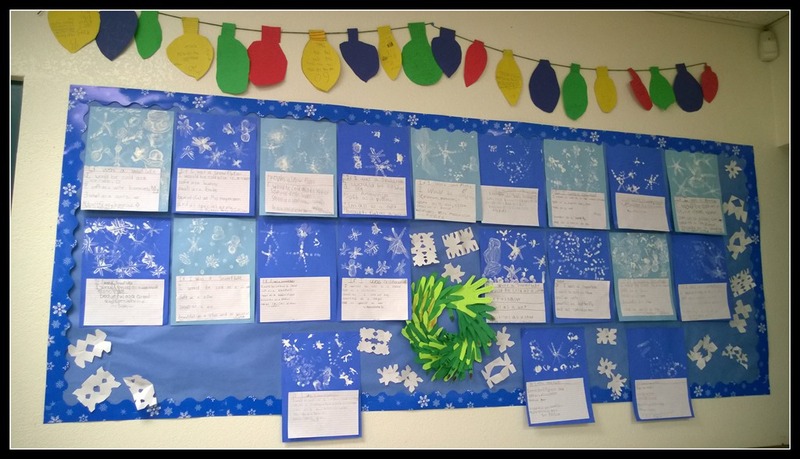 The students’ snowflake poems with painting done with bits of tree branch and Q-tips. So yes, I teach, but I also am being taught. I don’t know who is learning more – them or me. This entry was posted in Being a Teacher and tagged Learning, Life, Poems, Snowflakes, Students, Teaching. Bookmark the permalink. Thank you for your comment. It is amazing what I learn from my students everyday. There is quite a lot going on in my life right now. I am trying to focus on making some time for myself. I took a personal day last Friday and I want to carve out at least a little time to write/blog. What a beautiful post, and definitely true – we never stop learning in our everyday lives, but even in school where you would expect to know it all, it’s simply never the case! Thank you. When I step into that classroom each week, I am both a teacher and a student. It is exciting and a bit stressful all at once.